New York State's average jobs count in 2014 was almost 9.1 million -- the highest level on record. Here's one of the things about that: That jobs number includes full-time, part-time, and temporary jobs, and it doesn't break out how many of which -- or whether, say, one person holds two (or more) of those jobs. So while the state has a record number of jobs, the labor force participation rate -- that is, the number of people in the labor force as a percentage of the total working age population -- has been dropping (this has been the case nationally, too). It was at 60.7 percent in 2014, the lowest level more than a decade. There are a lot of reasons people might drop out of the labor force. Maybe they've decided to go to school, or stay home with a child, or maybe they've just become too discouraged about finding a job. There are also demographic factors involved -- people on both the young and old end of the working population spectrum tend to have lower rates of participation. Over the past five years, the population of 16-24 year olds in New York increased by 1 percent while the population of 25-64 year olds remained the same. However, labor force participation for both these age groups declined over this same five-year period. Conversely, there was a large increase in the population aged 65 and over, as well as significant growth in the percentage of this population remaining in the labor force. Because of a high concentration of students within the demographic, the participation rate of 16-19 year olds in the labor force has historically been low, averaging a third of the population. Similarly, the participation rate for those aged 65 and older has also been historically low, less than 20 percent. However, the unemployment rates for these two demographics - reflecting the number of individuals who would like to be employed but are not - are much different. The 16-19 year olds had the highest unemployment rate of any group, over 20 percent, in 2014, whereas only 4.3 percent of those who were aged 65 and older and in the labor force were considered unemployed. ... New York's labor force participation rate for those aged 65 and older has been steadily increasing over the past ten years, while the rate for 16-19 year olds has been decreasing. Possible causes for these phenomena may include the deferral of retirement of those over 65, whether or not for economic reasons, and the increase of adults over 20 years old working part-time for economic reasons, which would decrease the part-time employment opportunities for 16-19 year olds. By the way: The Capital Region had the second-highest labor force participation rate of the state's regions in 2013, behind only Long Island, according to the OSC report. Of all the jobs added in the state between 2009-2014, about 3/4 of them were in New York City, according to the report. The largest employment sector in the state: education and health services, at more than 20 percent. Before 2009, government had been the largest sector -- but it dropped more than 87,000 jobs around the state between 2009 and 2014. It was third in 2014 (at almost 16 percent), behind eds/meds and trade/transportation/utilities (17.1 percent). 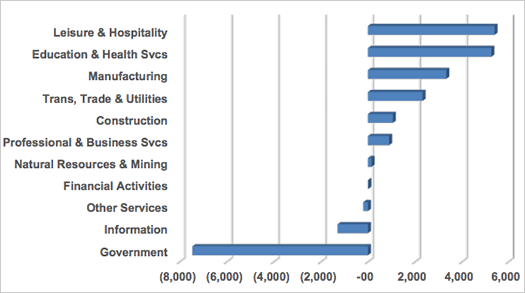 Here in the Capital Region, government is still the top sector, at 23 percent (as of 2015 June). Education and health services was #2 at 20 percent. The leisure and hospitality sector added almost 30,000 jobs in New York State last year, the second-highest total among all sectors (behind education and health). And it had the highest percentage growth of any sector between 2009 and 2014 (more than 20 percent). The sector also had the lowest average annual wages of any sector in the state in 2014, less than $30k. Average wage growth in the Capital Region was roughly 12 percent between 2009-2014 (inflation rate was 10.3 percent). That was second highest in the state, behind only New York City. Figures that information declines along with municipal and state government. Keep the masses in the dark and don't ask any questions. Baaaa.